October 26: Learning Illustrated | Learn. Share. Reflect. Even with the prescribed structure of school (school bells ringing to direct students from class to class, the restrictions of 7 period school days, the disconnect from subject to subject, common cores standards and pressure for high test scores) schools and classrooms hold tight to the Roman ideal from centuries ago: obligation to the communities we are part of (Scheuerman, 2014). The advancement of the individual student through the internalization of knowledge and the student’s application of that same knowledge to advance the community at large, are the two central educational targets which emerge from this Roman ideal. Teachers have the responsibility to provide their students with this knowledge with a compelling and practical curriculum that will enable and inspire them to effect change in the world. In order to transmit this, teachers must know their students (their interests, their goals, their fears, their world, etc.) as well as their own content and craft to support this end goal. This goal sometimes gets lost in the midst of standards and expectations that influence education, but with time and care this compelling and practical educational experience can be embedded within the instruction and alas, students will learn the content and connect with it in ways that are most important to them. And then it is in their hands to live it out in the world. Scheuerman, R. (2014, October). Session 4 Podcast A: The Roman Way and Traditional Values.EDU 6120 Foundations. Lecture retrieved from Seattle Pacific University, Seattle, WA. Scheuerman, R. (2014, October). 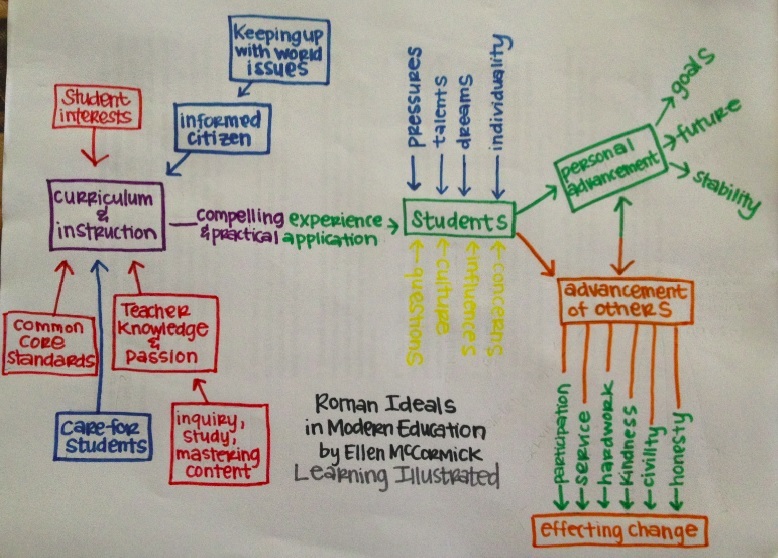 Session 4 Podcast B: Roman Individuals.EDU 6120 Foundations. Lecture retrieved from Seattle Pacific University, Seattle, WA. This entry was posted in E1, H5, O1, P1 and tagged civility, compelling, effecting change, hardwork, honesty, kindness, obligation, participation, personal advancement, practical, Roman ideals, service, shared knowledge, student interests. Bookmark the permalink.